Three people were killed in a freight train derailment early this morning in a mountainous region near Field, B.C., about 225 kilometres west of Banff, Alta. The derailment involved a west-bound grain train operated by Canadian Pacific Railway. The incident happened around 1 a.m. MST. CP officials confirmed the deaths of three CP employees later that day. The three deceased are believed to be a locomotive engineer, a conductor and a conductor trainee. “It is with great sadness that CP reports that three crew members on board were fatally injured in the incident,” CP said in a statement. Officials with the Transportation Safety Board said they were notified of the derailment around 2:10 a.m. this morning. 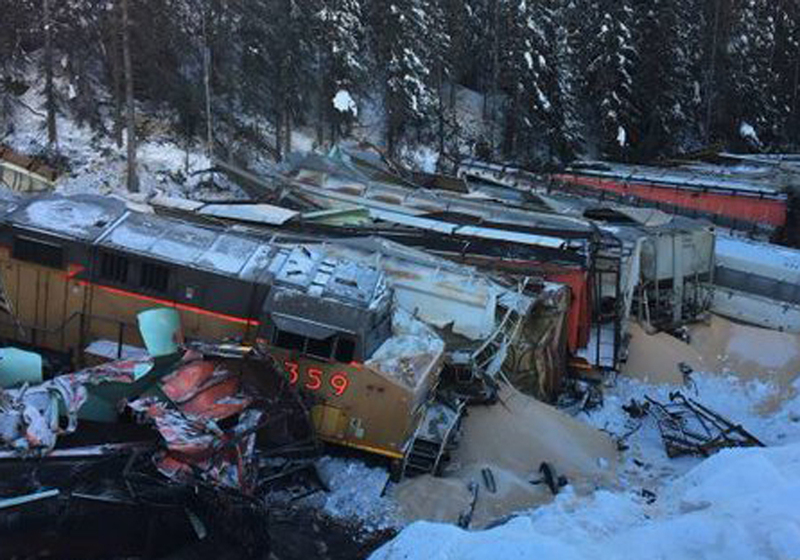 About 40 to 60 grain cars derailed on CP’s main line between Calgary and Golden, B.C., TSB officials said. The derailment was the second in less than a month in the area. On Jan. 3, another CP train derailed near Field, losing 16 cars. No injuries were reported in that incident. TSB staff were deployed to investigate the cause of the Feb. 4 derailment. Unconfirmed media reports said an estimated 25 trains per day travel on the CP line between Calgary and Golden, including prairie grain trains bound for Vancouver. The area where the derailment occurred, known as the Laggan subdivision, is among the most challenging sections of railway in Canada with steep grades, winding tracks and sections that are prone to avalanche activity. Environment Canada’s website suggested Feb. 3 night-time low temperatures were in the range of -18 C in the Golden area. Footage of trains passing through the area can be viewed online here.